This was fulfilled when Jesus was lifted up on the cross, then in his resurrection and ascension. God then tells us that His Servant will “sprinkle many nations”. The word used here means to sprinkle as in to declare clean from disease. Leviticus 14 describes how someone healed from leprosy or some other disease considered contagious was examined by the priests who would sprinkle with water to declare them healed. Through his death Jesus would provide for our cleansing from a disease far worse than leprosy. That disease is sin. The Predicted Saviour: The Servants Role. The reference to the ‘arm of the Lord’ refers to His power to save His people. The Cross is where God’s power resides. The Cross the power of God for salvation. Foolishness to the world, but the wisdom and power of God. The Predicted Saviour: The Servants Role. The Rejected Saviour: The Servant’s Life. Paul captures the essence of this in his second letter to the Corinthians. “God made him who had no sin to be sin for us, so that in him we might become the righteousness of God,” (2 Corinthians 5:21). Verse 6 probably derives its imagery from the ritual on the Day of Atonement. In Leviticus 16 the high priest symbolically transfers the sins of the people to a goat, known as the ‘scapegoat’ by laying his hands on its head. 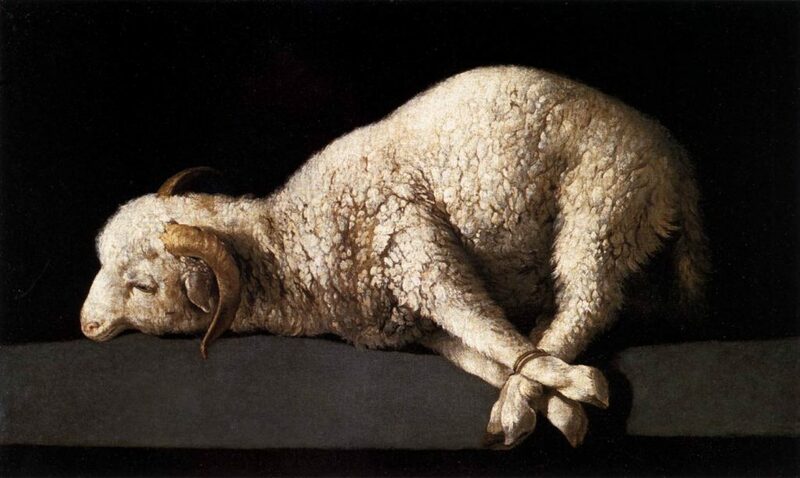 Then the scapegoat was driven out into the desert to die; even as Christ, the Lamb of God, was crucified outside the city. The Predicted Saviour: The Servants Role. The Rejected Saviour: The Servant’s Life. The Representative Saviour: The Servant’s Suffering. We have two kinds of eyes, eyes in our head and eyes of our heart. What are the eyes of your heart looking at? Desire. It’s describing people who have a capacity to want more and more of Jesus. Why don’t we want Him? We are full of other stuff. We’ve been feeding on the Smarties of this world. We fill our hearts and minds with work and wealth and worry. Cars and clothes and careers. And we don’t have room for Jesus. The arm of the Lord is revealed for those who seek him, who desire Him. “… and as one from whom people hide their faces he was despised, and we held him in low esteem.” (Isaiah 53:3). Low esteem = low value. Jesus is not valued very much in this world. The world says that Jesus is a religious leader to be respected. His teachings are worthy to follow, just like the teachings of Gandhi, Mohommed and Buddha. But to esteem Him above all? Compare that to Philippians 3:8: “I also consider everything a loss because of the surpassing worth of knowing Christ Jesus my Lord.” (Philippians 3:8). To value Him is to become captivated Him. Captivated by His love – above all else, above all powers, above all thrones. The arm of the Lord is revealed to those who seek him, who desire him, who respect him, who receive Him and to those who above all else, above everything and everyone else, value Him as the Suffering Servant, our Saviour and Lord. These are the ones to whom the arm of the Lord is revealed. Have you sought him? Have you received him? Do you desire him? Respect Him? Value Him? Only Jesus Christ has the power to set people free from heroin addiction and from alcoholism, from guilt, bitterness and fear, to reconcile husbands and wives, to reunite parents and children, bring healing and wholeness, forgiveness, peace and hope. How? The arm of the Lord points to how He is a soft place for His people to fall. Have you failed recently? Have you fallen? Have you disappointed yourself. Are others disappointed with you? The good news is His arms are a soft place for you to land.